I love snow, and always feel like it’s a beautiful gift from God for me to enjoy, and especially when I can make yummy ice cream out of it! I don’t know about your part of the country, but around here we’ve had a very mild winter. I love snow and winter time, so it’s been quite strange and slightly disappointing (though I try to be thankful for every day God gives me, no matter the weather :)). I was very excited when we did get a few inches of snow this week, and enough to make snow ice cream! Add sugar, vanilla and milk…. It’s all frozen (obviously), so you can enjoy it right away! 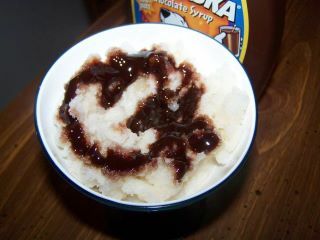 There are variations you can do if you’d like – this time we drizzled organic chocolate syrup on top! When it starts to snow, place a large, clean bowl outside to collect the flakes – or find an area of clean snow to scoop. When you have 16 cups, stir in sugar and vanilla to taste, then stir in just enough milk for the desired consistency. Serve at once. Enjoy this “heavenly” treat. Now if only we had some snow! I remember the days of living where there wasn’t much snow. I loved the simple lifestyle and area very much – but I did miss the snow! Ack, and we just had 7 inches of snow last weekend! This looks yummy and the kids would love it! It is fun, and the kids DO love it!